Change.org uses social networking to help social causes. The site already has it’s own network for linking volunteers to causes and voters to politicians. 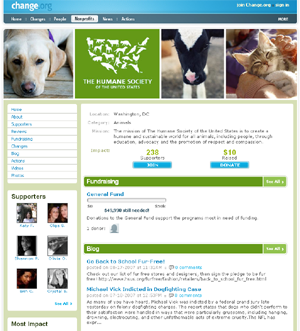 Now they’ve also launched a new Ning-like DIY white-label social network for non-profits. For the launch, they’ve already partnered with 50 non-profits, like CARE, Greenpeace, and Amnesty International. Any other non-profit can launch their own network as well, as long as you have a government approved tax ID number. You can sign up for one here. Like Ning, non-profit pages are part of their overall network and can be redesigned with a variety of modules. Any member of Change.org can become a member of these networks. They have modules for all an organization’s main needs: events, fund raising, forums, blogs, members, and posting photos/video. I really like how Change.org is evolving overall. The site is about connecting people passionate about a particular cause and not engaging in a shouting match or symbolic gestures of online support. Other useful services for non-profit work include Wild Apricot, Idealist.org, Tree Nation, and Kevin Bacon’s Six Degrees.